This week I learned this lesson well. Monday was Day 1 of my new Creative Nonfiction Online Writing Bootcamp Class. I was so excited, even though I haven’t written creatively in…well, let’s just say it’s been a while. Each time I sit to write, I struggle. I’m not even writing very well anymore. Instead of writing, over the years I chose to focus on editing. I am very happy with that choice and wouldn’t change it for a second – I prefer editing over writing. But writing is very important in my life, and it’s the reason I took the path I did in high school, college, and now, in my career. To give writing up completely wouldn’t make sense to who I am, and it certainly wouldn’t help me. So as I blogged about recently, I decided to take a writing bootcamp course. It’s to break fears, and establish the habit that many of us find so hard to keep up with. Writing is just as much something you have to work at, as exercising and eating healthy are. These are all important things in my life that I am striving to work towards, so there is no reason I shouldn’t put just as much effort in my writing, as I do my health. Day 1 of the course I wasn’t super fond of the prompt. It just wasn’t sparking creativity in me, and I was allowing myself to be held back by the constraints of “following a prompt” which kept me from enjoying it. The piece I submitted that day was horrendous. I hadn’t written that…simply in years. It was disgraceful. But you know what? I didn’t care. It felt great. I was writing again, and that’s all that mattered. We are not going to get it right every time. It just doesn’t work that way. If I write like crap for the rest of the class, I still won’t care, because for me, all that matters is I am establishing the habit again, and finding joy in the writing! I miss that feeling of writing because you just have to – it’s in your skin, your bones, and you need to get it out. I used to write like that constantly, and sure, most of it was not very clever or prose-like, or much anything at all, but that was okay. My goal is to write much, and often, and maybe after enough of that, I won’t have to work hard at it anymore, because it will be a habit I can’t break. And not everything will be a masterpiece – but the more I write, the more I have to chose from. I’ll have created so many different pieces that I can chose whatever selection I’d like to grow on, revise, edit, re-write. So even when the instructor was the only one who commented on my post Day 1, saying “let’s think of ways we can revise” I had no shame at all. This is for me, not for anyone else to judge. This is for re-discovering writing -and at that, myself- again. Whoa, I need to get a profile picture up here! Thank you for your comment! Have you had any experience with this yourself? 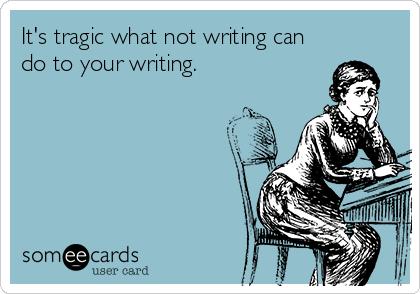 Yes, I’ve gone through “dry spells” and other times when I just didn’t discipline myself to write every day. When I realized I was at a stand still, I would go back to the beginning of my manuscript, or sometimes just go back several chapters and get into the story once again–get back inside my characters’ heads. I also find that reading works by other authors is helpful and inspiring. If I’m not reading, I feel as if I’m stagnating. My imagination is vivid and active. I’m a daydreamer also, and writing is an outlet for all those stories bouncing around in my head! That’s so great you can tell when you are starting to “fall out of it” and you have ways of getting back to it! This is why I always find it so impressive when anyone can write an entire novel – it takes discipline!! So true! Last week I read ‘Darkness Knows Me” by an independent author, Chrinda Jones. I just finished “Now You See Her’ by James Patterson, and I’m getting ready to read ‘Anna Karenina’ again. Next, on to another independent author, and then back to another classic, ‘Pride and Prejudice’. Juggling writing and reading with a full time job is a challenge, but you are right; it takes discipline.